On this date in 1851 — mere hours after a similar exercise of summary justice took place in Sacramento — the San Francisco Vigilance Committee strung up two accused crooks. This was the throes of the California Gold Rush — and San Francisco was its epicenter. San Francisco entered the gold rush an unassuming port of perhaps a thousand souls … but she exited it as one of the American West’s leading cities. It made an unruly adolescence for the boom town as penniless treasure-hunters poured in from every quarter of the globe. “Turbulent, gold-hungry men,” wrote Herbert Asbury in his The Barbary Coast: An Informal History of the San Francisco Underworld “transformed the once peaceful hamlet of San Francisco into a bawdy, bustling bedlam of mud-holes and shanties.” Suddenly, San Francisco had a huge crime problem — not to mention the conflagrations* that repeatedly devastated the fast-growing tangle of tinderworks shacks. In an effort to sustain some measure of order, a number of the city’s respectable citizens banded together to create a famous or infamous Vigilance Committee. Two days later, they proved their chops by hanging on no authority but their own emigre from Australia named John Jenkins for stealing a safe. A month later, James Stuart, also late of Sydney, was lynched at the Vigilance Committee’s hands, too. 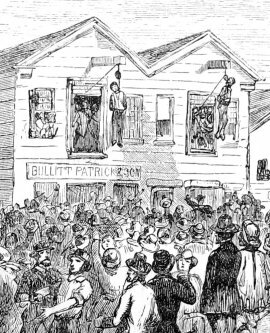 Detail view (click for full image) of Whittaker and McKenzie’s lynching. Though not the first Vigilance Committee hangings, Samuel Whittaker and Robert McKenzie might be the best-known. Like their predecessors, Whittaker and McKenzie had arrived from Australia** — which had aptly bequeathed to gold rush San Francisco a criminal colony of its own in the form of a network known as the Sydney Ducks. Scrambling to save his own neck, Stuart had informed on a number of these confederates. Whittaker and McKenzie were arrested based on Stuart’s information, as the Vigilance Committee tried to smash up the Ducks. Though extrajudicial, the Committee’s investigations were at least as meticulous as one might expect from the law at this moment in time, and the minutes of its witness interviews can be read here. In the end, the two were basically convicted not so much for any individual crime as for their lengthy careers of robbery, often violent — for “divers offences, whereby the safety of Lives and property have been endangered” (as read the executive report on Whittaker) that rendered each “a hardened offender, and dangerous to this community … it would be unsafe to hand him over to the Authorities or mete out to him a less Penalty than Death” (as read the report on McKenzie). Such an arrangement of juridical powers, exercised in lieu of “unsafe” Authorities, can scarcely persist long-term. Here, the governor of California, John McDougall determined to intervene in order that the fracturing of the Australians’ vertebrae would also vindicate the majesty of the law. McDougal arrived to San Francisco and secured a writ to seize the suspects from the Vigilance Committee’s hands, tucking them away in the county jail. Although in principle this orderly and lawful prosecution of malefactors was exactly what the Committee wanted to see happen, Gov. McDougal’s intervention when they were on the brink of consummating their own process left everyone with a frustrating sensation of justice interruptus. And so that next Sunday — August 24, 1851 — when prisoners were removed from their cells to a chapel for the salvation of their souls and the jail’s guard detail was reduced by the proportion of gendarmes attending services of their own, a party of 36 Vigilance Committee men barged into the jail, overpowered all concerned, and seized their prey. “Never before was San Francisco so excited,” editorialized the Steamer Alta California (Sept. 1, 1851). Through every street, in all directions, the hurrying crowd of humanity rushed with the utmost precipitation — no one knew whither, no one knew for what. The bell of the Vigilance Committee had sounded its alarum note — and instantly the streets were living, swaying masses of human beings — uncertainty and conflicting fears and hopes ruled the hour … with a sweep like the rushing of a torrent of lava they bend their course towards the Rooms of the Vigilance Committee. Almost instantly California street, Battery street, and all their approaches, are filled with one dense mass of human beings. From lip to lip the news flies that the two criminals, Mackenzie and Whittaker, have been taken by force from the jail, by an armed posse of the Vigilance Committee. On the eager and excited multitude press toward the Rooms. On, on, on — the crowd becomes denser and broader. Wonder is stamped on every face — a solemn, almost awful silence pervades the thousands who are anxiously gazing up at the building, when quickly the doors are opened — a moment of preparation — and the numberless multitude holds its breath as the two malefactors are seen suspended by the neck — a struggle or two, a spasmodic heaving of the chest — and each spectator feels a thrill of terror coursing his veins as he involuntarily utters — dead, dead, dead! Such are the terrible effects of misrule — these are the fruits of maladministered laws — these the results of official corruption, neglect and malfeasance. Well may the patriotic and the good turn in sadness and grief from the contemplation of such horrors. The timid may shrink from beholding them — the quiet desire an end to them; but neither fear, regret, nor desire will accomplish our security. It must go abroad over the land that this community possesses the power and the will to protect itself against every species of wrong, and that it is resolved to do it at all hazards. Whilst we regret that the Vigilance Committee have by this act, been brought into direct collision with the constituted authorities, we cannot but approve their course in executing the two criminals. This condition of affairs was not sought by the committee; it was rather forced upon them by the action of the authorities. True, the authorities acted rightly in rescuing the men; but the course they took has proved to be unnecessary and injudicious. No one doubts the guilt of the men executed, and no one believes but that they deserved the punishment they received. The Vigilance Committee felt this, and believing that the public welfare would be promoted by the act, they had resolved to execute Whittaker and Mackenzie. But the officers of the law, with unusual adroitness, prevented the decision from being carried into effect. The Vigilance Committee have now redeemed their honor, and carried out their original determination, by recapturing the prisoners and executing them. The line of division between the legitimate civil power and the Vigilance Committee is therefore plain, broad and unmistakable. And what is to result? We see nothing disheartening or dispiriting in the prospect. On the contrary, we think we perceive that settled determination on the part of the body politic to have justice done, which is to be the great lever of our salvation. When crime is convinced, as it must now be, that nothing is capable of preserving it from speedy and avenging punishment — when the abandoned feel, as they will now feel, that there is no safety for them here — when all bad men shall understand, as they may now understand, that their unworthy acts will surely be visited with condign reward — then will the country rise above its tribulations and its sorrows. * These fires were widely feared to be the product of arson motivated by the opportunity to loot. This is likely a reversal of cause and effect. One inclines here to reckon with Tolstoy that cities have a natural tendency to kindling fire, and those fires are liable to blaze out of control in inverse proportion to the city’s administrative faculties. The late San Francisco police officer and amateur historian Kevin Mullen puts together an argument here that merchants opportunistically torching excess stock to sustain gold rush price gouging was also a contributing factor. ** Both men were born in England; many of the Sydney Ducks hailed originally from the British Isles. † Like Batman, the Vigilance Committee later emerged from retirement to fight crime again, in 1856. The sight of 36 Vigilance Committee members storming the county jail en masse must have been an amazing site! 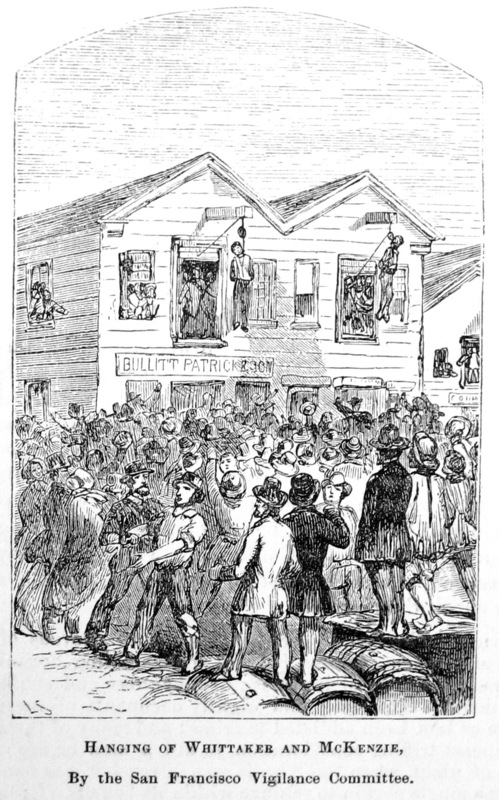 To give some background on the location of the hanging, the Vigilance Committee rented the top floor of Bullitt, Patrick, & Dow (not “Son”, as the picture would have you believe) on June 17: “…[T]he whole of the second story of the frame house on Battery Street between California & Pine Street situatied in the rear of Macondray & Cos brick building being the same house the lower story of which is now occupied by Bullitt, Patrick & Dow…” [c.f. Papers of the San Francisco Committee of Vigilance of 1851, pp 42-43] They paid $400 per month, which will get you about 2/3 of a square foot today. Currently, that site is partially occupied by either an Illy’s or a Starbuck’s. Enjoy your espressos, San Franciscans!